Entering the final two weeks of the 2017 NFL season, we’re staring down the home stretch to Super Bowl 52 in Minneapolis. 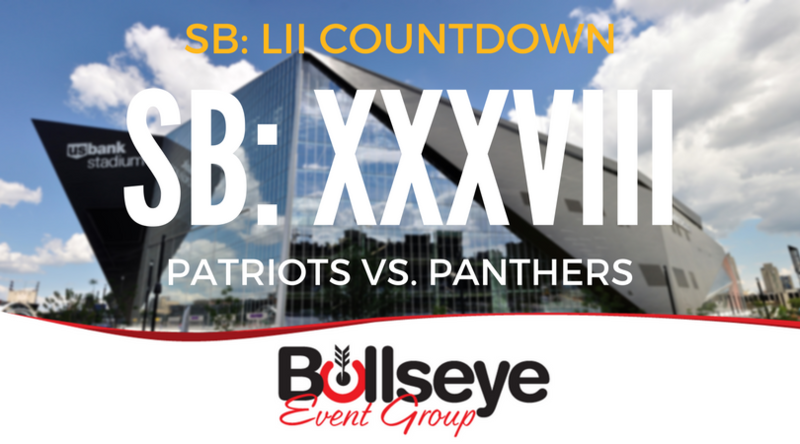 Next up on our countdown; the New England Patriots face the Carolina Panthers in Super Bowl XXXVIII. The second of three Super Bowls to be hosted in Houston, Texas, the New England Patriots would square off against the Carolina Panthers in their second Super Bowl appearance in three years, winning the second Super Bowl of the Brady-Belichick era with a game-winning field goal from kicker Adam Vinatieri, 32-29. Patriots quarterback Tom Brady (surprise!) would go on to win his second Super Bowl MVP of his career, also the second in three years. Brady would set a Super Bowl record for most pass completions in a game, completing 32 of his 48 pass attempts, and netting 354 yards and three touchdowns in the victory. Super Bowl XXXVIII halftime lives infamously in history as far as public performances go, as this was the infamous Janet Jackson/Justin Timberlake duo that featured a wardrobe malfunction on live television. There were over 89 million viewers who caught Super Bowl XXXVIII on CBS, a game that was called by Greg Gumbel, Phil Simms, Armen Keteyian and Bonnie Berstein. Beyonce would perform the national anthem ahead of kickoff, and the cost of a 30-second commercial rose to around $2.2 million in 2004.